On more than one occasion I thought I'd tapped Salvador's supply of new and wonderful fruits, but I always took a second look when we passed a fruit stand and went out of my way to check out the produce section at the grocery store. Just in case. And on more than one occasion, I was rewarded with something I'd never seen before. When I was extra lucky, I could even figure out the name of the new fruit so I could write about it. One of those extra passes through the fruit section at the grocery store yielded today's fruit, the sapoti, or sapodilla. Sapodillas look and even feel like potatoes. I get pretty excited when a fruit doesn't look like much on the outside, because I've frequently been rewarded with fruits like maracujás and goiabas that are all inner-beauty and deliciousness. And imagine if you were the first dude to ever cut into a watermelon? That guy is a god somewhere, I'm sure. It has gone the other way, too, like with the cajú - it looked amazing but fell completely short of expectations. And then, there are the straight-up dud fruits, the ones that I'm sure can be cooked somehow or mixed with something to make a delicacy, somewhere, but eaten straight off the vine (OK, out of the grocery store) just didn't please our North American palates. 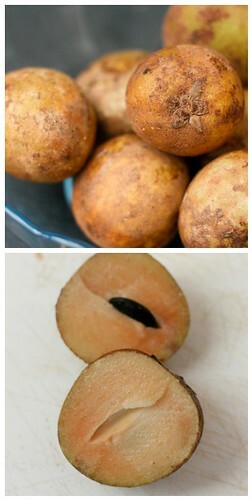 One example is the genipapo, and another, unfortunately, is the sapodilla. According to Wikipedia, sapodillas are supposed to be delicious. According to me, they are not. The one I tried tasted astringenty and had even more of that chalky texture we found in the cajú and the persimmon, which I now realize probably means those fruits are all high in tannins. Turns out I prefer my tannins in red wine form. The sapodilla has a cute seed, though, that's just kind of tucked inside. I guess that's something. Ooh... almost forgot. Ask someone to lead you to an atemoya. It looks like a fruta do conde, and tastes very similar, but wonderfully different. We definitely saw it in markets in Rio, so hopefully you'll get it in Brasilia. Tchau! We used to eat this Sapoti a lot in India and I miss this fruit. When ripe, it tastes wonderful. When it is not ripe, it can be very bitter and also acidic. You should try it again by ripening it more by putting it in a rice bag or in a jar with hay. It is also called Chikhu in other parts of India. From what you said, I think both the persimmon and the sapoti you ate were not ripe enough when you tried them. Let someone who knows what to do with them (like judging the proper ripeness or even choosing the best examples) show you. This is true of many fruits that are unfamiliar to us.